Forsyth Tech offers extensive firefighter training through our Fire Academy. We also offer firefighter certification courses. 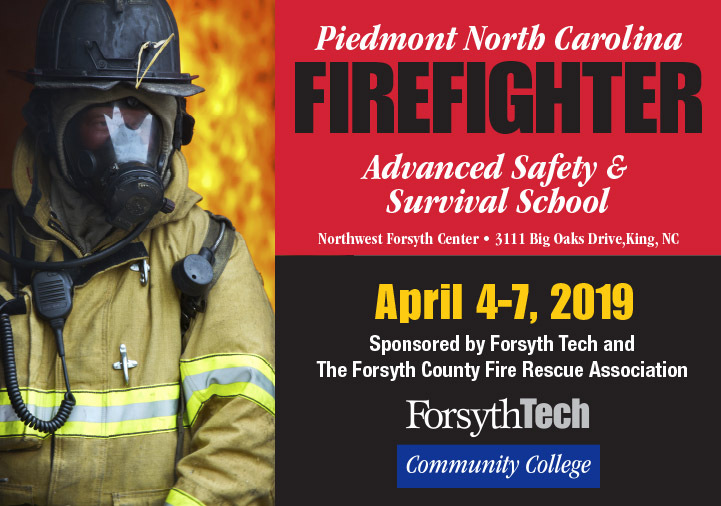 The Piedmont North Carolina Advanced Firefighter Safety & Survival School is a physically, mentally, and highly challenging training opportunity. The courses will challenge the firefighter to dig deep and take advantage of their full firefighter survival instincts. Thursday & Friday 6-10 p.m. and Saturday & Sunday 8 a.m. – 5 p.m.
A completed Self-Contained Breathing Apparatus (SCBA) and one spare cylinder, in full working condition, marked with your department identification. Cylinders must be within current hydro date. Excellent physical condition and fully capable of operating in simulated firefighter compromised situations. Space is limited, so register now! Limited to the first 40 registered participants. Preregistration is required for any firefighter and rescue certification courses listed below. Note: Pre-registration is required for all courses! Forsyth Tech Fire Academy is an intense 19-week program (8:00 AM – 5:00 PM, Monday through Friday) that uses real life scenarios and conditions to prepare firefighters for the challenges they will face. It provides rigorous training and will test you physically and mentally. You will work with highly qualified instructors who have the experience and know-how to train you for anything, and you’ll learn using the latest technology. The Academy takes place at the Emergency Services Training Center at the Northwest Forsyth Center in King. The facility offers the latest advancements in firefighter training, including a six-story Burn Building that lets you experience a variety of real life scenarios under controlled burn conditions, and a five-story Drill Tower that lets you learn how to get in and out of high-rise buildings. As a graduate of the Academy, you will be qualified to work as a firefighter and can apply for a position with your local fire department. If you want to expand your training, Forsyth Tech also offers an Associate of Applied Science degree in Fire Protection Technology as well as an Associate of Applied Science in Emergency Medical Science.